Former UFC middleweight kingpin Anderson Silva has agreed to fight perennial contender Kelvin Gastelum on November 25 in Shanghai, China. Anderson “The Spider” Silva is coming off a controversial decision victory over Derek Brunson at UFC 208. Meanwhile, Kelvin Gastelum is coming off his first loss since moving up to the UFC’s middleweight division. Gastelum was finished by former champion Chris Weidman at last month’s UFC on FOX event on Long Island. Prior to that, Gastelum had scored back-to-back finishes over Vitor Belfort and Tim Kennedy. Who do you think will win this exciting middleweight fight? A key middleweight battle has been booked for June’s UFC 212 pay-per-view event in Brazil. The UFC announced that former division kingpin Anderson “The Spider” Silva will be squaring off with surging contender Kelvin Gastelum at the June 3 event in Rio de Janeiro. Anderson Silva was last seen in action at UFC 208 where he scored a unanimous decision victory over Derek Brunson. Meanwhile, Kelvin Gastelum was last seen in action at last weekend’s UFC Fight Night event, where he scored a stoppage victory over mixed martial arts legend Vitor Belfort. Who do you think will emerge victorious when Silva and Gastelum lock horns this June in Brazil? Former Strikeforce champion Gegard Mousasi picked up an impressive second-round TKO victory over former UFC champion Vitor Belfort at yesterday’s UFC 204 event in Manchester, England. (Watch the highlights here). The victory marked Mousasi’s third in a row, as he had previously scored victories over Thiago Santos and Thales Leites respectively. The Armenian spoke about always being an underrated fighter at last night’s UFC 204 post-fight press conference. “I think I’m underrated throughout my whole career. I don’t know,” Mousasi stated. “Maybe I’m from Holland, people don’t care, but I don’t know. Maybe throw some bottles at someone’s head and then people gonna notice me. The fight that followed Mousasi’s beat down of Belfort was a rematch between Dan Henderson and Michael Bisping for the UFC’s middleweight championship. Bisping emerged victorious via a close judges decision last night in Manchester and Gegard spoke about how a potential fight with the brash Brit would go down should they ever meet. Mousasi continued by saying that for some reason Anderson Silva keeps stealing his fights. “I was scheduled to fight [Bisping], but somehow Anderson Silva show up,” he said of the UFC Fight Night 84 bout in February of 2016. Mousasi and Bisping were originally slated to face off, but UFC management went another direction, giving Silva the bout against the Brit. “He took my fight,” Mousasi claimed. “I was supposed to fight DC. I was ready, I was able to go five rounds. It was me or Anderson Silva at that moment,” he said, noting he was in the running to face Daniel Cormier at UFC 200 after Jon Jones was removed from the card last minute. Mousasi remains hopeful that he will get a top contender fight next, if not handed current champ Michael Bisping. Who would you like to see Gegard Mousasi fight next? According to Anderson Silva’s son, his father will be fighting former UFC welterweight champion Georges St. Pierre (25-2 MMA) this December. The fight would mark the first time that “GSP” has competed inside the cage since November of 2013, when he scored a split-decision victory over Johny Hendricks at UFC 167 to retain his welterweight championship. 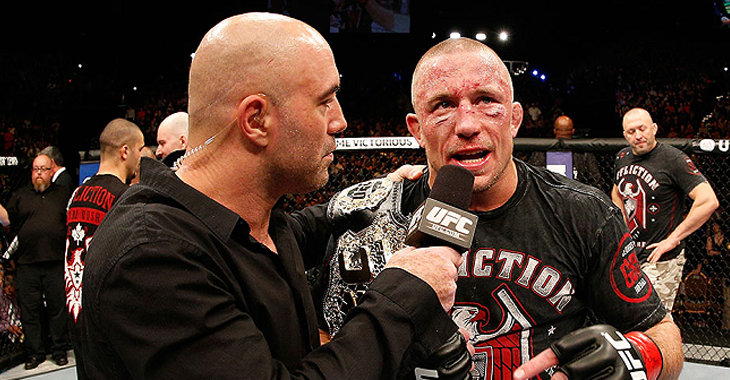 Following his victory over “Bigg Rigg”, St-Pierre shocked the mixed martial arts world by announcing that he was walking away from the sport, thus vacating his UFC welterweight title. In his return to the octagon, the Canadian superstar would be looking to extend his current win streak to thirteen in a row by scoring a victory over “The Spider”. Anderson Silva was last seen in action at July’s blockbuster UFC 200 event, where he suffered a decision loss to current UFC light heavyweight champion Daniel Cormier in a bout which he took on just two-days notice. Prior to that, “The Spider” was outpointed by Michael Bisping at UFC Fight Night 84 in a bout that received “Fight of the night” honors. Silva has been in a bit of a slump lately, going 0-4 with 1 no-contest in his past five bouts. Before the skid, “The Spider” had reeled off sixteen straight victories and was considered by many to be the greatest fighter on the planet. What do you think of the match-up?